Until now, the 5.7-inch Nexus smartphone by Huawei has only been a collection of well-founded rumors and hearsay. But new leaked images are finally putting a face to the name, and it’s a little weird-looking. Google’s annual round of Nexus phones, which usually launch around the end of October, tend to be made by all sorts of manufacturers, and supposedly Huawei and LG are up to bat this year. But the new Nexus phone from Huawei may have one strange addition—a type of camera hump we haven’t seen on phones for at least three years. 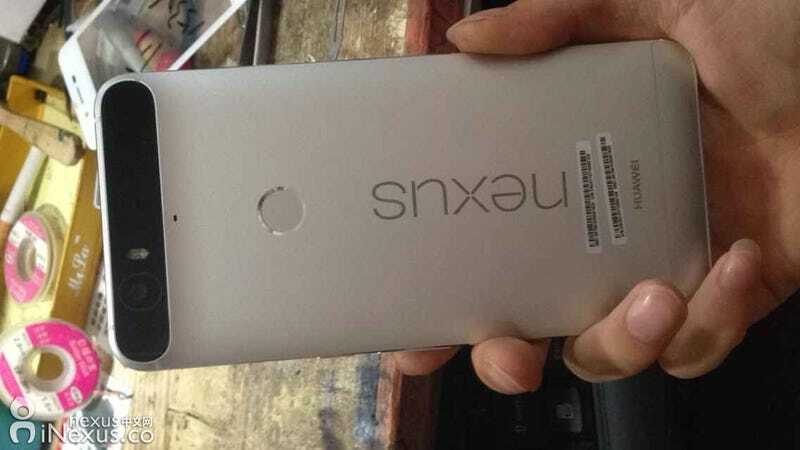 In the latest leak, there are two views of the Huawei Nexus. One shows the naked device (left) while the other appears to have a case or something, which only makes the camera wedge on the back look all the more intrusive. The maybe-fingerprint-scanner is that small circle in the center of the back. This matches the fingerprint scanner from the LG Nexus leak last week, which gives these photos a little more plausibility. While gawking at this bizarro phone, keep in mind that we’re are not totally convinced of the leak’s legitimacy. But that giant camera module is curious. Does it involve depth sensing? Or is it simply a design choice to invoke the old-school Droid Razr (if you consider 2011 “old school”)? Who knows, but we’ll be watching to see if any other sources can confirm (or deny) this throwback design.